First time poster here and could use some help. Sorry in advance for the long post. 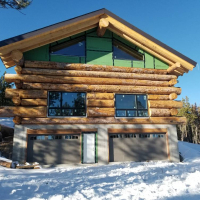 I'm building a custom log cabin at about 9000 feet of elevation in the Colorado mountains and I've gotten to the point where I need to start making some heating decisions. One thing I'm sure of is that we won't be doing forced air, since there's not an easy way to run ductwork given this construction style and I don't really want to do that anyway. The cabin is a 40x40 square with a drive under garage. I ran pex for radiant heating before the slab was poured in the basement. On the main floor I think I'm more or less locked in to Warmboard or similar, since my structural engineer says that using lightweight concrete would be dangerously close to the design load limit of the joists and support beams. It's hard to get a bead on the energy efficiency of this place due to the non-standard construction. The roof is insulated with rigid foam with an R-56 rating, and the windows are all high efficiency but the walls are ... well ... logs. Really really big logs, ranging from 18" to 30" in diameter, with rockwool insulation and cement based chinking to fill the gaps between logs. So getting a specific R-value is a head scratcher. Here's my current dilemma. I'm at the point where I need to make decisions on the heating system, and I just found out a good friend of mine has a mod-con boiler and accessories sitting in a closet gathering dust. It's a two year old Lochinvar Knight already set up for high elevation along with a big box with the expansion tank and lots of the associated bits and bobs. He bought all this stuff planning to put it in his house then realized it wasn't going to work for a variety of reasons, but he wasn't able to return it. He's currently out of work and could really use some cash. The only problem is that my best guess is that I'll need something in the 85-110k BTU range given the elevation and this boiler is only 55k BTU. I'm sure it would provide handle the basement / garage radiant and DHW via indirect with no problem. That's important in the short term, since I'm getting the well pump and pressure tank installed in the next few weeks and will need heat down there to keep things from freezing. So what do y'all think? Buy the 55k unit from my buddy, knowing that I might need to buy another if it can't keep up? I can always add a second unit for the main level if needed, though that would obviously complicate the plumbing quite a bit. Or get the bigger unit from the start? First, on the R-value for the logs. Better than you might think. I presume ponderosa or douglas fir? An 18 inch log with the joints well chinked and brought out will have an R value somewhere between about 18 to as much as 24. I'd use 18 and a standard heat loss calculator -- like slant/fins. If your buddy will give you a good deal on the "used" boiler, I'd go for it and set it up for the lower level. If you find, after you do your heat loss calculation, that it can handle the whole thing, well and good -- if not, get another one dedicated to only the upper level. Don't try to run them together -- treat them as two really separate systems. I would do the heat loss before rushing into anything. You need to know what your up against. 1600 square feet can't really say without a heat loss or your outside design temp but the 55k may do it by itself. With a full log home the rvalue becomes less important than infiltration rates. Problem with a full log home is infiltration is a floating number with age, and maintenance of chincking. Also as logs shrink, check, and settle the infiltration rates change. I certainly would not under size the boiler. It may be okay at first, but down the road all bets are off. Is the radiant all slab on grade? One other point on r value for the logs would be how much thickness the mating surfaces will have once milled down flat. I’d use that thickness for log r value. It gives you some cushion. The logs are beetle kill Engelmann Spruce, with a few Doug Fir for the vertical support logs. Thanks for the info on the R-value. Now that I think of it another advantage to a 2 boiler system and leaving the main floor separate is that I don't have to pay for the Warmboard or similar right away. The quote I got on the Warmboard-R (subfloor is already in place) made my eyes bleed! We do have a wood burning stove we can supplement with on the main level on the very coldest nights. Did you price warm board R? Since your sub floor is already in place. I’d keep your radiant panel system as an over the top configuration. I'd be buying the correct sized appliance to begin with. Have you done a heat loss calc to determine the load? I'd also consider either Climate Panel or QuickTrac as an alternative to WarmBoard. Do a full and proper heat loss calculation to determine what you need. Not going to have much loss through the roof with that at R-56, about 1.6 BTUs per hour per sq. ft. at a 90F design delta. Wood has an R-value that ranges from about 0.7 for hardwood to 1.4 for soft wood; different species have different values. If the average wall thickness is 20 inches of R 0.7 wood, the walls have a heatloss of about 6.5 BTUs per hour per sq. ft.
Good double pane windows have a heatloss of about 45 BTUs/hr/sq.ft., triple pane are about 30 BTUs per hour per sq.ft. Good exterior doors are 30-40 BTUs per hr. per sq.ft. Need to do all the math to determine structure heat loss. Room-by-room is best. Is there insulation under the radiant slab? Englemann spruce itself will be around 1.2 to 1.3 -- but I'd still go with around 1 to be conservative. Moisture content of the wood has a lot to do with perceived r values. It’s another floating number for a heat loss calculation. Yes, there is R10 foam under the basement slab. I've done several heat loss calculations for the whole structure and come out between 80k-100k pretty consistently depending on assumptions and who's took I'm using. One question I can't seem to find a solid answer to is how to account for the DHW energy requirements when sizing the boiler. The 40 Gal Lochinvar Squire lists a 115k coil load. Does that just get added to the heating requirements for the structure, so I'd need around a 200k BTU/H boiler for both DHW and heat? If you're using an indirect hot water tank, you size the boiler on the home's heatloss do not add anything for the indirect. Any size mod-con you choose will service the indirect adequately. 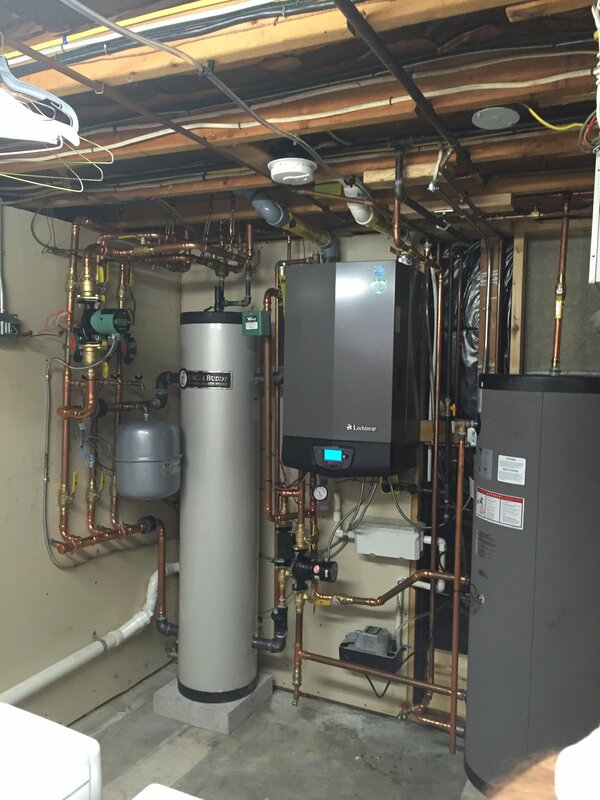 Consider that most stand-alone hot water heaters are in the 30-40K BTU range, so your mod-con will have no issues heating your indirect. I’d skip your opportunity for the whn 55, and get the right size. The tough load calc with logs is where they stack on one another, the R-value there is the lowest. Use the best chinking money can buy as logs can shrink a lot in arid SW climates. I'd consider a humidifier of some sorts. I've seen those large logs shrink and open cracks that you could stick you hand in. And logs that were saddled with just fiberglass strips between the logs where you could see daylight after the logs dried. I'd error on the safe side with and boiler sizing. The mass of the logs does create a nice flywheel and they can maintain at below design conditions for a few days. Don't forget the altitude derate on the boiler. Lochinvar is very specific, so you should look up the exact model. Generally the derate is ~2% per thousand. You can never go wrong with 2 heat sources. Always nice to have back up (s). I would get a good 3rd party load calc done. If it's new construction I would think it's quite feasible to keep the heat loss within the range of that boiler but it's definitely not a given. Are you going to have a wood stove in the cabin? If you do I imagine that it will be cranked up on the coldest nights. But with the thermal mass of the log structure it will take a while to change the temperature with a tightly sized boiler/emitters. The next size up Lochinvar has a similar min fire rate (I think around 8000 btu/hr) so going bigger in this case probably makes sense. Yes, we have a wood burning stove sitting in the basement waiting for me to install it. It's a Kuma Ashwood and is rated for - coincidentally - 55000 BTU on cordwood. I've got about 9 acres, heavily wooded, so firewood won't be much of a problem. Is this full time occupancy? You mention cabin which I consider part time. The reason I ask is will the system be using glycol for freeze protection? Unless the undersized boiler, potentially, is extremely low priced, I'd jump up to the correct size. But we are all speculating until a load calculation is performed. So if it isn’t full time occupancy there are some strikes against you. Especially undersizing. If you are going to be using glycol. It reduces heat transfer. If you will be bringing the cabin out of a cold soaked condition the mass of the logs will be another hurdle to get up to temp. Altitude as @Zman mentioned derates the boilers output. The house / cabin will be part time occupancy to start, yes. Eventually we'd like to get up there full time but that's a couple years out yet. 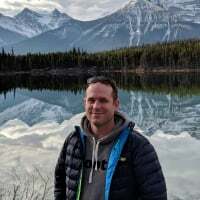 I hadn't thought about the effects of Glycol and the altitude de-rate. Both good points. Seems like the consensus is to go for the right-sized unit and I can't really argue with that. This pretty much sums it up. The flexible chinking holds up much better than mortar based. I have a neighbor with the exact same log construction. He borrows my IR cam every year to find gaps in the logs and chinking. He finds new ones every time. 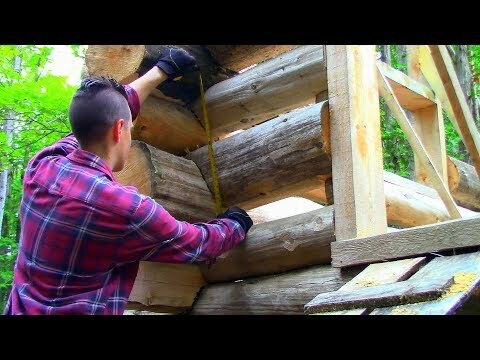 The best log designs I have seen are where they cope the logs to stack them. So you get a 6" or more contact to seal the log to log connection. Really not much contact difference between a 18 or 30" log, it's two round surfaces coming in contact. Plumbing also needs slip joints as log homes settle as they dry. This is why thy leave a large gap above windows to allow for the settling. Devil is in the details. Depends on type of log construction. Also depends on consistency of log diameter from one end to the other. When I see mesh with mortar chinking, and rock wool stuffing, I envision big, and irregular gaps. Urethane based chinking only bridges so far. I could be wrong but I don’t think these are milled logs as far as mating surfaces. Gordy has it exactly right - these aren't coped logs, they're pinned together with rebar and the gaps are filled with Rockwool covered by stucco lathe and a cement based chinking. On some of the smaller gaps I'll use Log Jam, which is a synthetic chinking textured to match cement chinking. These logs were standing dead for several years so they were already nice and dry before we stacked them. Spruce bark beetles wiped out a huge amount of forest in southern CO / northern NM. 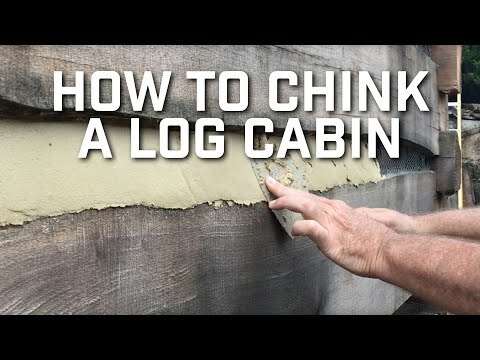 I'll be touching up chinking for the first couple of years but it shouldn't be bad at all compared to a cabin built with green logs. Supposedly the guy in the second video claims he has never had to rechink his method.....he uses spray foam instead of Rock wool.